Source: ARTBA analysis of federal Census Bureau data for value of construction work in January through May 2011-2014, adjusted with the ARTBA Price Index to account for changes in material costs, wages and inflation. The real value of construction work on highways continued to show modest improvement in May 2014, bringing the amount of work for the first five months of 2014 up 5.7 percent compared to the same time period in 2013, when accounting for project costs and inflation. Although the increase in market activity is welcome, it is important to put it in context—real highway construction activity has declined steadily since the Great Recession hit in 2008 and was at a 20-year low in 2013. So although pent-up demand is driving some of the increase in 2014, investment is still below pre-recession levels. The sustainability of the market increase is questionable, given the current uncertainty surrounding the Highway Trust Fund (HTF). 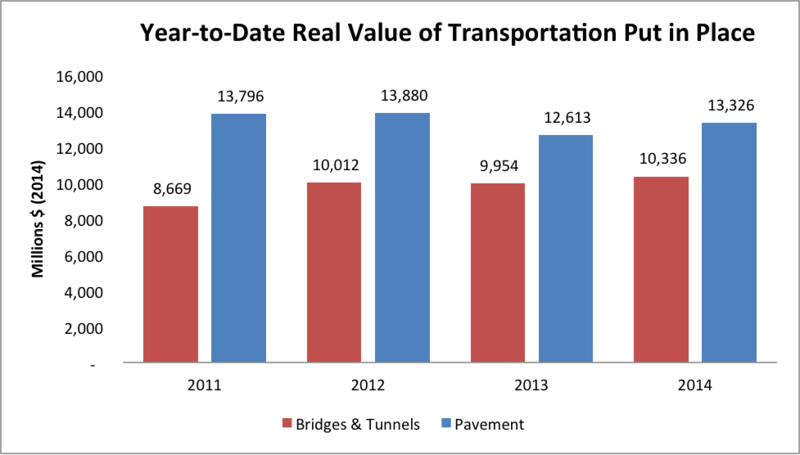 ARTBA analysis shows that highway contract awards through May 2014, a leading indicator of future market activity, have slowed in 30 states compared to the real value of awards during the same time period in 2013. There are 31 states that have publicly said they will have to consider delaying or canceling projects over the summer months if the HTF situation is not resolved. With fewer contract awards in the pipeline, we would expect the value of future market activity to also decline. Other modes showed mixed growth in the first five months of 2014. Construction activity in the bridge market increased by four percent from January to May 2014 compared to January to May 2013. The real value of construction work on subway and light rail projects was down one percent, while the value of railroad construction activity was up two percent compared to the previous year. Airport work was down five percent, while the real value of construction work for ports and waterways was up 14 percent. Detailed data by month and mode is available as part of ARTBA’s market subscription reports. For more information, please contact ARTBA’s Lital Shair at lshair@artba.org.